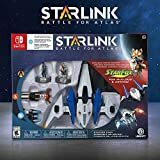 As we saw during the E3 2018 and Gamescom 2018 events, Ubisoft is officially jumping into the toys-to-life category with the impressive, creative Starlink: Battle for Atlas title for the PS4, Xbox One and Nintendo Switch. Players can pick up the game as part of a starter pack and get access to modular starship toys, which are then mounted on your controller, which will then be reflected within the game itself. This morning, in advance of the October 16th, 2018 launch, Ubi dropped off a new Starlink: Battle for Atlas gameplay walkthrough title which shows off some of the action and adventure to be found in the game. Check out the trailer and recent screens below. Join the heroes of the Starlink Initiative in this Starlink: Battle for Atlas gameplay walkthrough. Take on the Forgotten Legion and the Outlaws of space when Starlink: Battle for Atlas launches October 16.